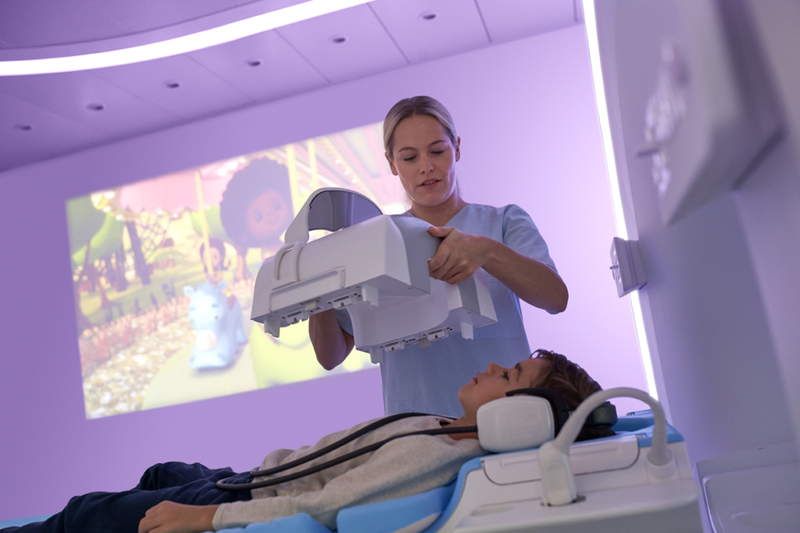 The Marina room is one of many themes offered by GE's Adventure Series, which transforms scanner rooms into other worlds for patients to gaze at and imagine exploring during imaging exams. A 16-year-old boy walked down the hall of the newly opened UCSF Benioff Children’s Hospital for what he thought would be another nerve-wracking MR scan to monitor an ongoing medical condition. But his fears vanished instantly as he entered the MR suite and came face-to-face with a “boat”, surrounded by “scuba tanks” and a backdrop that looked like the San Francisco’s Fisherman’s Wharf. As the MR technologist instructed him to hop aboard, the teen was comforted by the make-believe and was able to undergo the scan with greater ease – and for the first time ever, without anesthesia. The boat, in reality, was the MR scanner, surrounded by a painted picture of the San Francisco Wharf area and oxygen and anesthesia tanks designed to look like scuba gear. All are elements of the marina theme, one of many designs offered by GE Healthcare’s Adventure Series, which transforms MR rooms into environments in which imaging is less scary and more inviting. Like Benioff, many providers have sought out a range of new technologies to mitigate fears of imaging and the challenges they create. Doing so, however, requires an understanding of where the fear arises from and what resources, in and outside of technology, are required to help children cooperate to produce high-quality images for accurate diagnoses. Undergoing an imaging exam is relatively harmless, with the most painful part being an injection, if required. Many children often are unsure of how to process and communicate fear, causing them to feel anxious during procedures and not cooperate with the technologist. This is commonly expressed in their inability to remain still during exams, a crucial component in producing quality images for accurate diagnoses. Though services such as anesthesia are available to calm and relax the child, its use can often be a hindrance in conducting procedures. Anesthesia also increases risks, extends waiting periods for procedures and means higher costs for exams. Another area of fear lies with the noises made by the machine. The presence of an audio system in the form of headphones can act as a soothing distraction, making patients feel more at ease by providing music for them to listen to and a way to interact with the doctor and technologist. immerses patients in a video experience. In addition to the marina room, Benioff also possesses rooms modeled after California’s redwood forest, the San Francisco Golden Gate Bridge, its cable car system, and the Bay Area. The aim is to distract the child from the fear they feel toward the procedure. This, however, is just one of many innovations available for quelling patient fears. 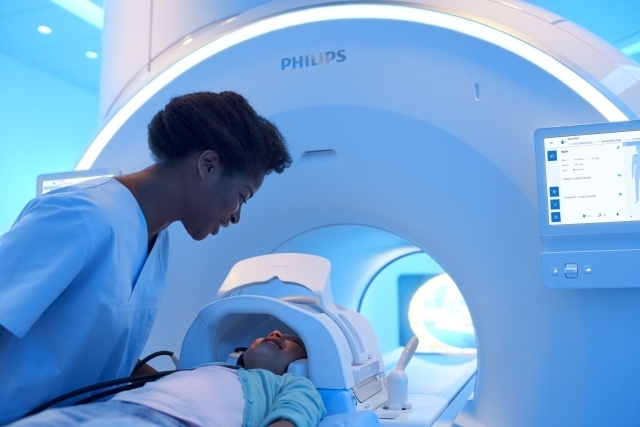 For instance, at Arkansas Children’s Northwest, children undergoing MR procedures are fully immersed in other worlds with the use of the hospital’s Philips Ambient Experience In-bore Connect. The use of visuals has become commonplace in imaging environments, with TV screens fitted within the MR scanner and specialized goggles handed out to watch movies or TV series during exams. Some even consider such technology and immersive experiences to be a stepping stone in the development of virtual and augmented reality tools. The cost of this equipment, though, can be dear, and out of the price range of many providers. Howe’s own company is currently trying to address this problem with the development of an affordable video display called MRIview that provides movies or TV shows for patients to watch during scans, and at the same time, is equipped with a camera to allow staff to monitor the patient to ensure they are safe, comfortable, positioned correctly and not moving. Christoffer Endresen, a regional sales manager in Norway, Sweden and Denmark for NordicNeuroLab, says that while pricey, such innovations can be worth it in the long-run for a hospital’s return on investment. Echoing this sentiment is Paul Bullwinkel, president of Avotec, who says that shifts in value-based care have changed the game of reimbursements, and that fears of children can make all the difference in what a provider gets back financially. For providers seeking to calm pediatric patients during procedures, a medley of options are available, from mock scanners and proxies to lightweight coil technology to video and audio systems. But technology alone does not make all the difference in imaging children. The right skills, expertise and understanding by staff members must also be present. Prepping children for any exam requires more than just the right technology. It mandates a need to relay as much information to them as possible on a level they can comprehend. To do this, teams of child specialists are dispatched to consult and interact with the child, as well as their family, to speak to them in terms they can understand about what to expect, so that procedures can be performed as seamlessly as possible. At Stanford, Vasanawala relies on GE’s Air Technology, a “blanket-like” suite of lightweight and flexible radiofrequency (RF) coils that enables greater freedom in coil positioning and handling during MR scans, for procedures such as brain or body scans where the patient is traditionally covered in a heavy coil that can create discomfort or deter them from going through with the exam. He says the solution helps calm children to the point where they don’t even need to be sedated and is likely to evolve even more. Visual technology is also expected to evolve, with many anticipating the eventual development and introduction of virtual and augmented technologies. “Having that technology will ease anxiety by transporting the patients to a variety of locations, whether it be via games, music, or movies,” said Kight. While fear may always exist among children during imaging exams, efforts continue to expand the number of technological options available for soothing and eliminating such emotions, for the production of high-quality images to aid in making accurate diagnoses for the correct course of treatment.